Purity Products dove deeper into the ocean to see how to make the powerful benefits of fish oil's omega-3's stronger and faster. With this discovery, Purity Products used their dedication to evidence-based formulas to create a potent new original krill and fish oil combination. Purity's molecularly distilled, concentrated fish oil from Norway was enriched with krill caught in the pristine waters of the Antarctic and fortified with 100 mg of Coenzyme Q10. 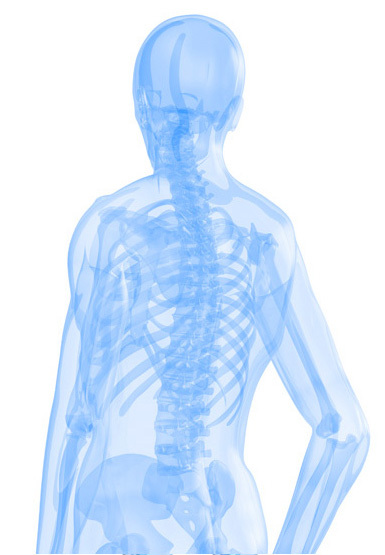 The result is Krill Omega-3, the only formula with krill and fish oil combined to create 10 times the DHA and EPA of regular Krill oil plus 100 mg of CoQ10. Take two lemon flavored softgels daily for maximum health benefits. LemonLock Freshness System - No fishy aftertaste or burping! Purity’s LemonLock® Freshness System locks in purity and seals in freshness. Unlike some other companies whose Omega-3's may go rancid, our LemonLock® System infuses our Fish and Krill Oils with a potent antioxidant complex - sealing in the purity of our Omega-3's. It’s a difference you can experience. 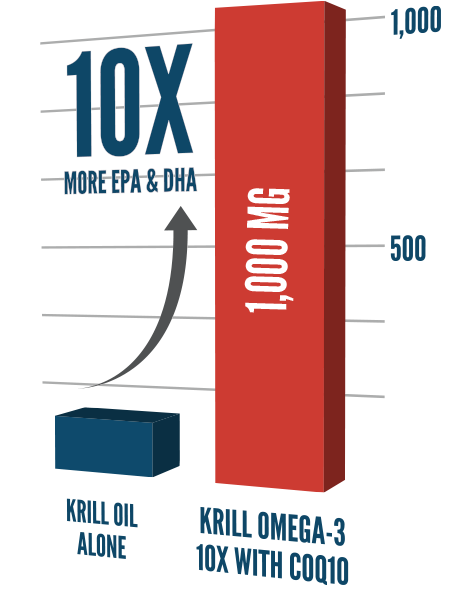 The Krill Omega 10X with CoQ10 breakthrough lies in the ground-breaking marriage of Krill Oil with Purity's elite, ultra-pure, super-concentrated fish oil. 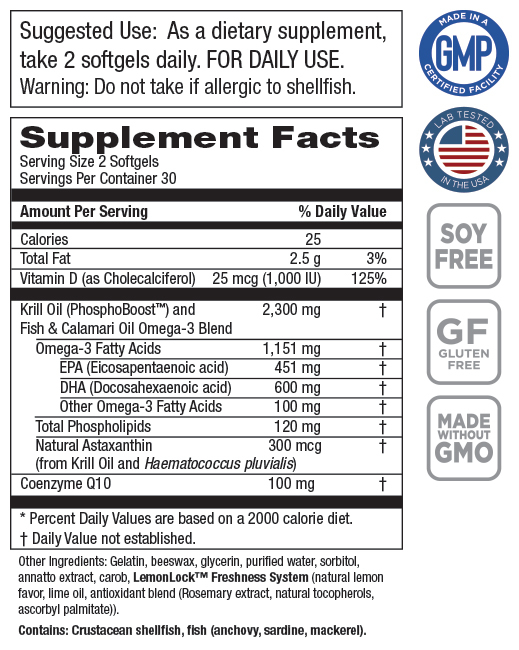 Each two soft gel serving contains 1100 mg of omega-3 fatty acids from krill and fish oil. 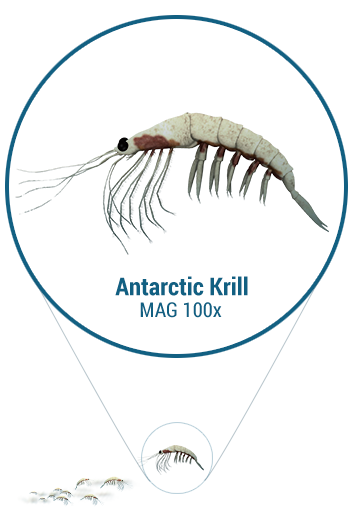 Each serving supplies a minimum of 300 mg of krill oil, in keeping with current krill science that reveals meaningful benefits for joint comfort and flexibility. † - $4.95 shipping applies. By accepting the free bottle offer (30-day supply) you will be enrolled in our Super Saver program, locking in the low Super Saver price of just $41.95 per bottle (26% off the retail price). As a Super Saver you will receive three bottles every 90 days - each bottle is a 1-month supply. Your first delivery of 3 bottles will arrive about 2-3 weeks after you receive your FREE bottle, so you don't have to worry about missing a day. Purity Products will charge the credit card used today for your 3 bottle shipments. Of course, you can customize your order at any time by changing the frequency, date of shipment and number of bottles shipped out to you. If you want to discontinue the automatic shipment, call us within the first 15 days and you will never even be billed.